Also known as Medline Select, Encore, or Premier Cloth scrubs are designed using the most generous cut in the industry. This shirt features a handy left breast pocket. Set-in sleeves and reinforced v-neck placket. Comfort durability and great economy pricing. Color coding is provided for instant identification in the laundry room storage and nursing units! Everyone is sure to love the feel of this fabric! Sold in case quantities of 24. Price below is the price per scrub. A traditional style top that is now reversible! One upper left chest pocket both inside and out. Neck bias is color coded for easy size identification. No matter what the season is or what your mood is we've got a color for YOU! 16 solid colors, all with matching pants! An upper left chest pocket and lower right pocket with scissors holder, on both sides! Comfortable, functional, and reasonably priced! What more could you ask for in a scrub? 55% cotton / 45% polyester blend that gets softer and softer the more it's washed. This top has it all, classic styling, great comfort, and many colors! 16 different colors to match every mood, personality or dress code! The 65% polyester / 35% cotton blend of the Comfort Ease fabric holds deep, rich colors and stands up to industrial laundering. This slightly longer v-neck pullover tunic scrub top has two lower pockets and side vents for easy movement. Center back length" 26 1/2"
Notch neckline. Matching cloth snap-ring closures. Set-in sleeves. Two large, top-loading patch pockets. Front and back princess seams. Hidden accessory tape inside right pocket. Side vents for movement. 65% Polyester/35% Cotton Medium length: 26 7/8"
Available in over 15 colors! A basic scrub top with added touches that professionals like yourselves will truly appreciate and love. This scrub has a unique snap-front design. Finally, something that's not just another pull over your head scrub top! We have added two large, front waist area pockets, one with a handy scissors holder. 10 different colors with the exact same color of matching bottoms! Made of highly durable, cotton-rich, 55% cotton / 45% polyester blend that gets softer and softer the more it's washed. 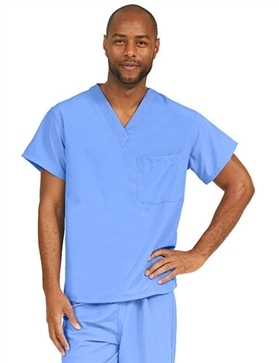 This unisex scrub top is made from comfortable, heavyweight, 100% cotton fabric. Finally a scrub top that is something other than Polyester! Made of 100% pre-shrunk cotton! Reversible shirt features cap sleeves and upper left chest pocket both inside and out! If this top had more storage, we'd have to call it a garage! This five pocket top is an easy-to-wear V-neck pullover with one breast pocket, two lower layered pockets on the left and a single pocket with an interior cell phone division on the right. Locker loops make this top easy to hang up after a long shift. 65% Polyester/35% Combed Cotton Medium regular length 30"